Peter Bakare and Nathan French with Appletree Garden youngsters. Top Olympians have gone back to school to inspire youngsters to take up sport, while raising funds for new equipment. Team GB Olympians Peter Bakare and Nathan French called into Appletree Gardens First School in Monkseaton, to help young players get the best out of their volleyball game. The duo took part in a sponsored fitness workshop to raise money to help fund Olympic athletes and school PE equipment. 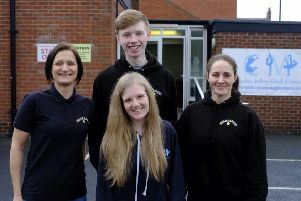 PE co-ordinator Dave Anderson, said: “It was great having two professional volleyball players come to the school and the children were very excited to meet them. “We are delighted that Peter and Nathan were able to talk to the children about their experiences and to hold a volleyball session. After a short assembly where they demonstrated their skills, the Olympians held a question and answer session for the children.